Okay to start with I do not recommend or endorse what is posted below, please check with your local building/plumbing codes before attempting a project of this sort. Now on with the show. So a little background, I live in an old 100+ year farm house out in the country (well where else would it be), where there is no natural gas heating, just oil, propane, wood and electricity and the house has all of those in some form. Now for those of you who aren't familar with old farm houses they were built in a time where insulation and vapour barriers and general all modern building methods were not yet invented. As such trying to heat the house becomes very difficult or expensive and as such we have learned to live with cool house temps as I slowly improve the house. Now back to the tank. Well I have 160g of water on the main floor between a 120g and 40g tank, then have the sump/fuge ~120g in the unheated basement. Now in the winter keeping the tank at a nice temperature of well anything above 5c was proving to be difficult after I setup this larger system a couple years ago. I started with the simple, insulated the sumps, but this had little to no help. Then there were the standard heaters, first 1 then 2 then 4 all 300 watt and still no dent. Then for 1 winter I borrowed a friends 1000w titanium heater tube, with no controller and added it to the mix pluged directly into the wall. As well I installed a baseboard heater in the basement along the wall beside the sump, and although it warmed the space it also would rarely turn off. So having almost 3000watts of heating running 24/7 quickly became too expensive and I was still only maintaining 70-75F. I had to find something better. This led me to search for heat exchangers. I started looking at titanium heat exchangers but found them to be quite expensive, and most were a coil designed to be submerged. This created the problem of space, how big of exchanger did I require vs how much room was avail. Upon further research I found an article about an Australian research facility who had similar issues as I did with heating and had come up with an easy way to use PVC piping and a standard hot water heater to heat the tank. This had to be tried. I had 50' of 1" spa flex lying around so picked up 50' of 1/2" Pex (all plastic, infloor heating) piping and started to build. The concept is simple, put the 1/2" tube inside the 1" tube, then pump hot water through the 1/2" tube and pump tank water through the 1" so water is flowing all around the hot water. I found a standard in floor heating pump to move hot water from the household HW tank, and back into the cold water feed for the tank, then used a mag 9 pump to move sump water through the 1". My initial test found that I could raise a 5g bucket of water from 60F to 90F in less then a minute. I was set. Now the next problem is control. I have an friend who is an electronics designer and he promised to build me a sensor to connect to the PLC that runs my system, but has yet to have time in over a year So what I have done in the mean time is to controll the hot water pump on a simple digital timer. I found, through trial/error, a on time/off time that will maintain the temp around 68-75 during the winter, and then allow the standard heaters to ballance the tank temp up to the ~78F mark for stable temp controls. I was planning on adding a ranco controller but now that I am tearing this tank down and setting up a new one, without the sump in the basement and in a dedicated tank room with dedicated heat and well insulated I will wait to see the outcome. 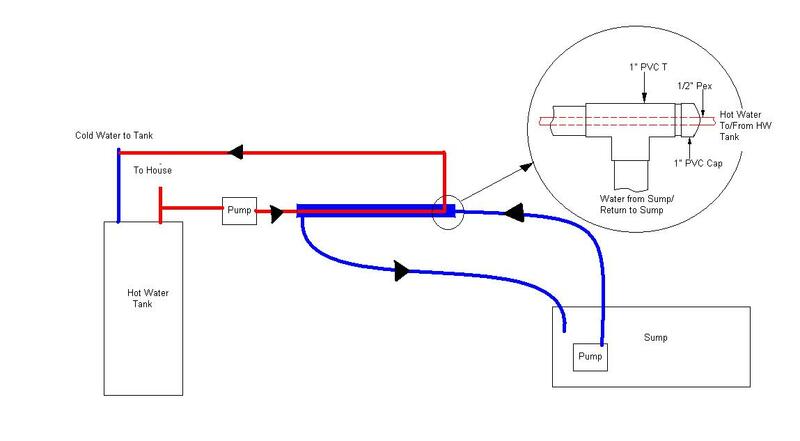 If you consider a system like this you have to ensure that the hot water pump is activated regularily through the entire year or that the system is disconnected and flushed, or you use the HW tanks designed for in floor heating apps that have a special exchanger coil. I have attached a drawing of the system I built as a photo really wouldn't show very much. Did you try to get a titanium coil instead of pvc ? the heat transfer would be better maybe coil it up in a bucket.. or directly in your sump. then have a valve trigger the inlet so heater's hot water only flows through when temp is below a certain point. all you would need is a heat controller and an electric valve. Just never spent the $$ to buy a controller and with the new setup this will be coming down, as I hope the small insulated and heated room, with 2-3 mHs will make it unnecessary. how many heaters were you able to get rid off?? I dropped the 1000w and baseboard heaters. If I would have gotten a controller made or purchased one I probably could have eliminated all the heaters completly. As it was I still kept 4 ebo's in the sump to help smooth the swings. I hope my next tank will only require 1-2 250w heaters.